So, it's here. HTC's worst kept secret in a while has been announced. To be fair, it was pretty hard to keep it under wraps, once chairman Peter Chou started waving it about in front of the media, but at least now it's all official and above board. We like that. And HTC's looking for salvation here. Let's be frank: the company's lost its way. Profits are down, sales are down, market share is down. A few years ago, if you weren't on an iPhone or a BlackBerry, chances were you were rocking an HTC Android device with a big clock on the homescreen. But times change – and Samsung got busy with its Galaxy line, ultimately stealing the top Android spot from HTC and making HTC wince. Of course, every launch is accompanied with the same cliches – "revolutionary, "the next big thing", "iPhone killer" and so on. We had it last year with the HTC One X and that hardly won over the masses. Step up to the plate, if you will, the HTC One. The HTC One features an all new design. Well, we say 'all new' – and it is for HTC. But you may think you've seen it before. Yup, it's a dead ringer for the iPhone 5 – particularly the white version. If Apple was annoyed with Samsung, we think HTC's bound to get it in the neck for this. Similarities extend to the three panels on the back and the silver border around the phone. From a design perspective, it's beautiful. As per its last few offerings, it's a unibody design and HTC describes it as 'gap free'. Available in silver and black, it's created from aluminium. We much prefer handsets like this – it's going to feel solid in the hand, like it means business and comes in at a respectable size of 137.4 x 68.2 x 9.3mm, with a weight of 143g. It means, roughly in the hand, it'll be on a par pretty much with the Galaxy S3, though the preference of metal over plastic will make it heavier. In fact, it'll be nearer to Sony's new flagship, the Xperia Z in terms of physical print, though that comes in an all glass flavour. 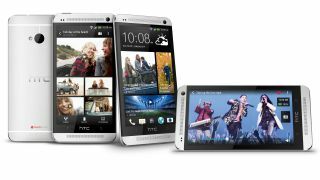 Opinion on design will differ – with some preferring Sony's elegant gloss and others much more favourable towards the metallic industrial feel of the HTC One. Naturally, a beautiful phone can end up as a beautiful paperweight if the processor isn't up to task. This used to happen a lot – but has not been as much of an issue in the last twelve months since OEMs started pulling their fingers out. Always helps to have something to boast about too on the spec sheet – and HTC is right up at the top with the HTC One offering a quad-core 1.7GHz processor of the Qualcomm Snapdragon 600 variety. That's sure to mean this phone never slows down. To be fair, it will be helped along by Project Butter – but even without that, we can think of few situations where the processor would be stumped. It makes last year's Exynos quad-core 1.4GHz offering on the Samsung Galaxy S3 seem so old fashioned. Although we did occasionally experience a half a milisecond of lag with that handset, it was by no means an annoyance. Sony comes in with a Krait 1.5 quad-core offering on the Xperia Z and that's more than respectable as it is. In reality, we can't see situations where any of these handsets will struggle. The thing is, even a good processor can be rubbish on a bad OS. And vice versa. Apple's iPhone 5 only give us a dual-core 1.2 GHz. On the face of it, that's very third world but you'll find few complaining of lag or slowdown on the iPhone 5. This is because it runs on such a sold OS. Likewise, Android should be able to cope and help the HTC One's processor to put its back into things. Screen resolutions tend to inspire real one-upmanship among OEMs. Apple's launch from the old style to retina really was groundbreaking and set the bar. It's hard to make something that replicates that first impression again – hence why even on the iPhone 5, two years on, Apple itself even, hasn't managed to top it. In our upcoming Xperia Z review, we talk about how amazing that screen is. Full TFT 1080 HD at 5-inches is pretty impressive. There are slight issues with it looking washed out now and again, but this is pretty much as good as it gets on Android right now. It also shows up the Galaxy S3 – when that was launched last year, in one of the biggest shocks of 2012, Samsung went for a Super AMOLED panel that actually can show pixels. Yes, you have to strain the naked eye but they can be seen and that's unacceptable in the eyes of many. With that in mind, HTC's made sure it can secure boasting rights here over the oposition. It's taken an almost identical screen size to the Samsung, but boosted it up to the quality of the Sony Xperia Z at 1080 HD. It's a win win situation.